Rabat - Morocco and the EU have signed two agreements to support the North African country’s social security reform and green growth programs. Morocco’s Minister of Economy and Finance Mohammed Benchaaboun and Johannes Hahn, the European commissioner for European neighborhood policy signing the two agreements. 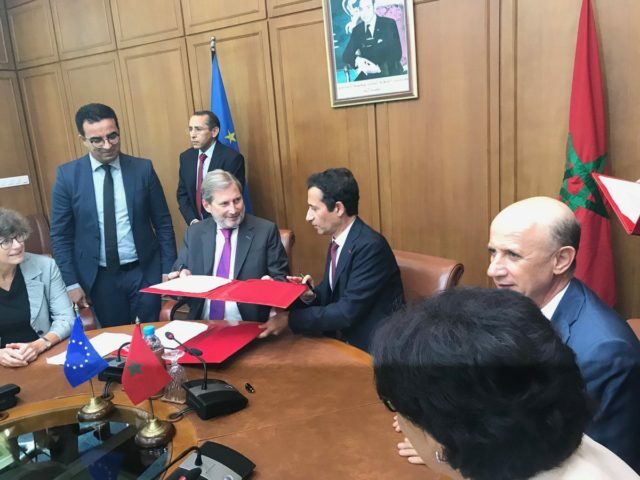 Rabat – Morocco and the EU have signed two agreements to support the North African country’s social security reform and green growth programs. The inking of the agreements comes while the European commissioner is on a working visit to Morocco. The visit aimed to enhance the EU-Morocco partnership and “review the EU’s commitment to support Morocco’s development programs,” wrote Maghreb Arab Press (MAP). During his meeting with Morocco’s head of government, foreign minister, and economy minister Friday in Rabat, Hahn promised to sign an EU-funded program to back small and medium-sized enterprises in Morocco as a pledge of the EU’s commitment to help with the development of Morocco. The EU supported the program “Competitiveness and Green Growth” with more than MAD 1.15 billion. The program concerns strengthening “the status of the self-employed entrepreneur, first-time exporters, the business climate and the emergence of recycling channels,” reported MAP. The second program which supports Morocco’s social security reform with MAD 1.19 billion will bolster the governmental effort to reduce social disparities and enhance human development in society by increasing access to basic social services. “Morocco is a respected strategic partner for the EU – because we know the contribution you make to stability and development in your region. And, we welcome and support the reform path you have chosen for your country. A strong partnership is in the interest of both sides. We have many shared objectives both for Morocco, the EU and for developments in Africa,” Hahn said in a press conference following his meeting with Moroccan foreign minister. “A strong partnership is in the interest of both sides. We have many shared objectives both for Morocco, the EU and for developments in Africa,” he added.